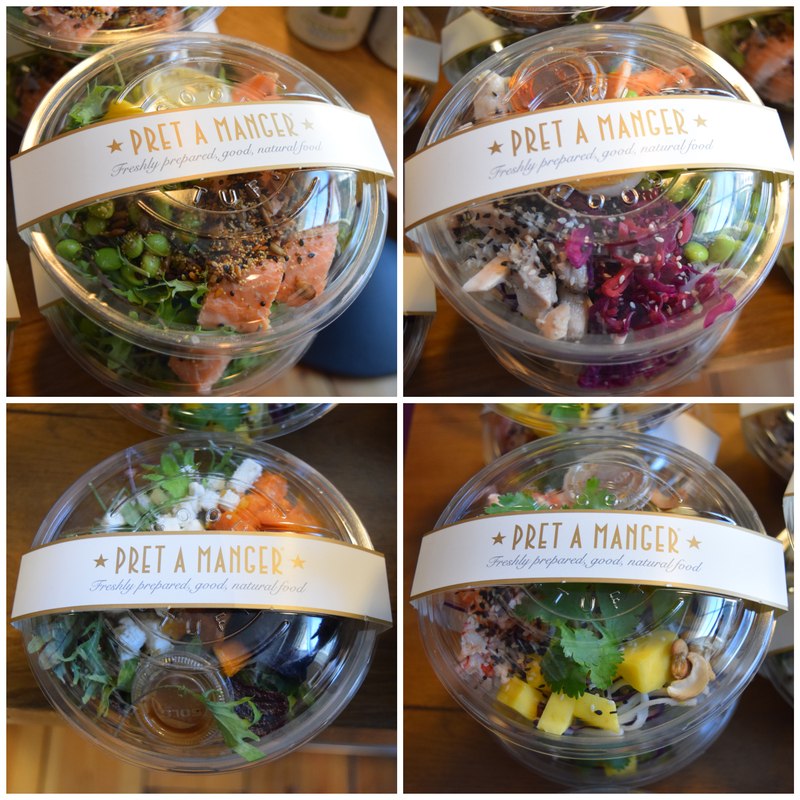 #PretSessions with About Time Magazine & Pret’s new Superbowl salad menu – Food That Makes You Smile! I’ve been thinking about how I can improve my blog recently; looking up all the little tips and tricks the internet has to offer. One of the obvious things to me (and probably to everyone) is to actually blog in the first place. That is where I have been failing, due to my busy lifestyle (and probably because of my addiction to the show ‘The Good Wife’). But then I discovered on Twitter that the lovely people at About Time Magazine were holding a ‘About time: You broke into journalism #PRETSessions‘ this weekend, which was focusing on getting into magazine and online journalism, as well as advice on how to build your personal brand and use social media effectively. I happened to be at the right place at the right time, as I saw that they were giving away 1 free ticket to this session. I tried my luck and BINGO, I got it… I’m sorry (not sorry) to everyone else. 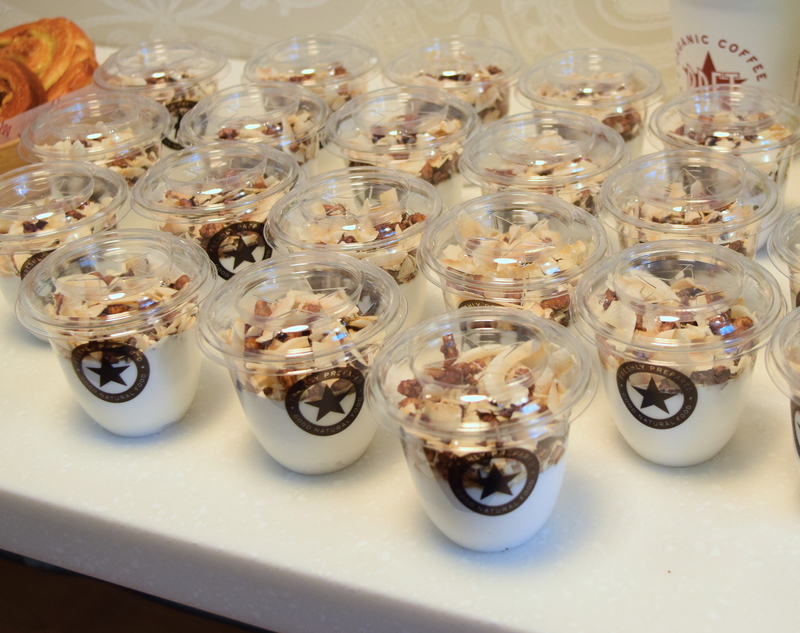 This session also happened to be held at the Pret A Manger Headquarters in Victoria, London. 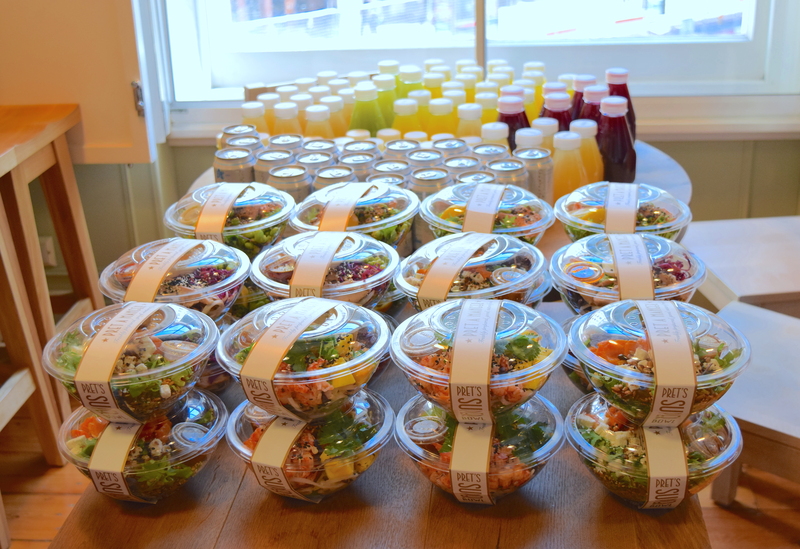 We were given the opportunity to try their new spring Superbowl salad menu alongside some other items that are being launched in Pret shops on Tuesday (21st April). So I was very excited! 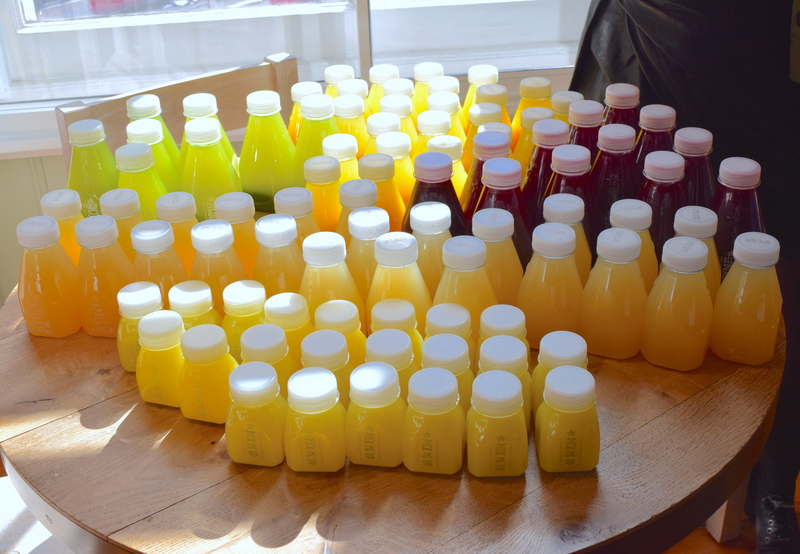 We were greeted with tea, fresh juices and an endless supply of pastries. There were so many pastries… it was like a dream. After some mingling and networking with fellow wannabe journalists and bloggers, I sat down with my peppermint tea and delicious pain au raisin, and we got started on the session and were looking forward to lunch. 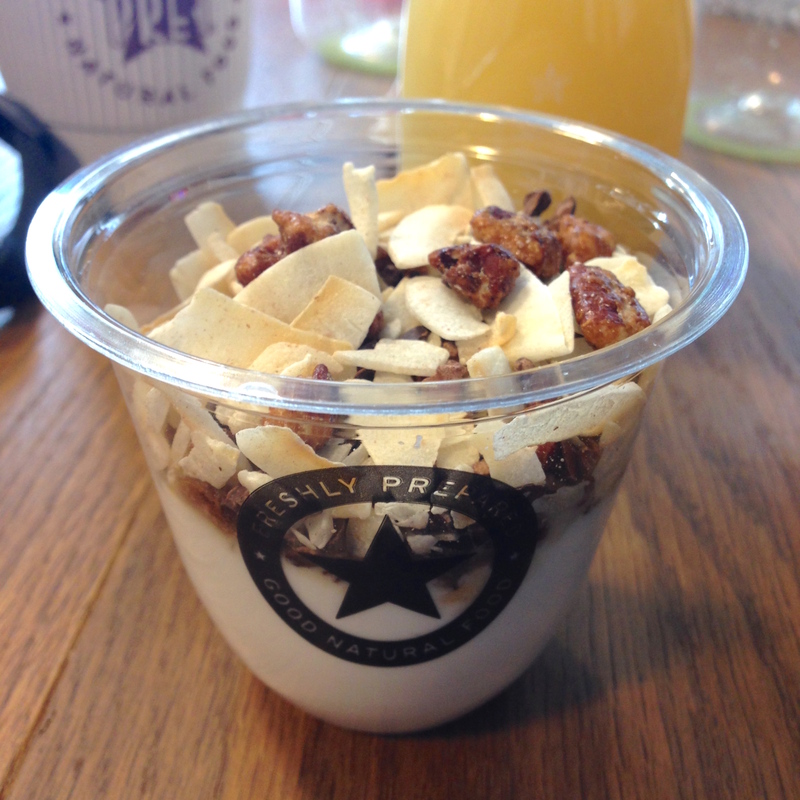 We got to try their new Dairy Free Coconut Yoghurt, which is topped with caramelised nuts, dried coconut & cacao nibs. Personally I wasn’t a big fan of it, as it wasn’t exactly sweet enough for me and I also found the cacao nibs left me with a slightly bitter aftertaste. But saying that, I can totally see others loving this, especially as so many people in the group couldn’t stop raving about it. This will be a big hit with all the healthy eating fanatics and dairy-free food seekers. They said that many people like to have this at breakfast or after lunch as a dessert alternative. 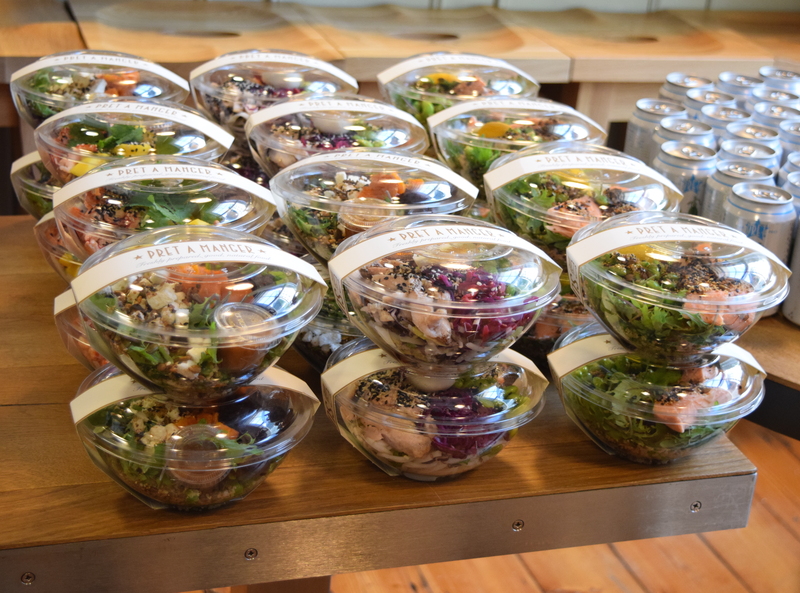 The Pret Food Development Team introduced their new salad menu and explained the story behind their food which was really good to hear. 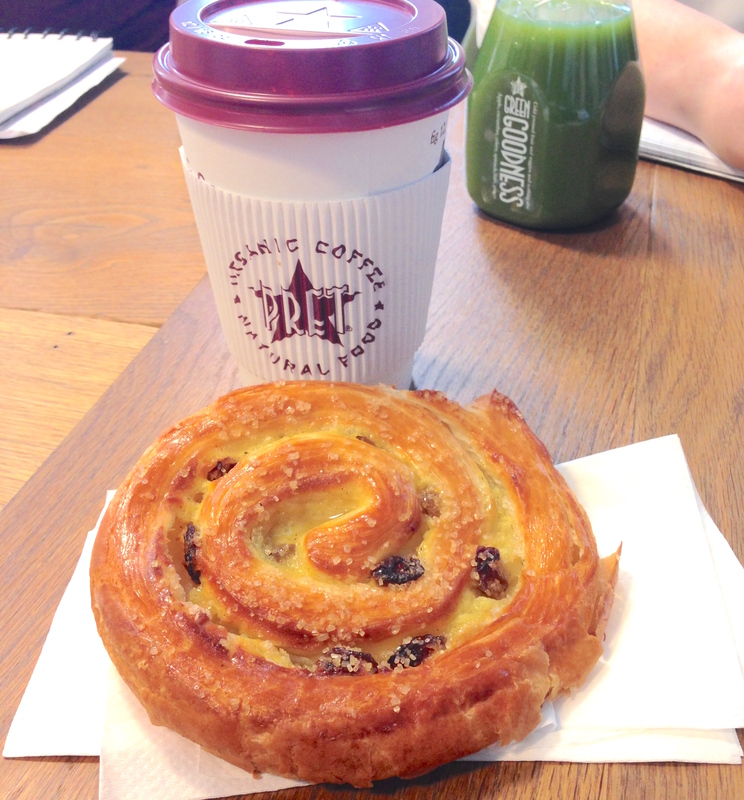 I’ve always liked Pret, but I’ve never really been a regular or loyal customer, so to speak. I usually just go wherever thats close by when hunger strikes. But just hearing about the work that goes into researching and developing each and every item in their shops, really won me over. I liked the fact that they aren’t generally an overly competitive company, which in a way shows how much they believe in their product. I also liked the fact that they’ve done their research well and are trying to give people the best value for their money. 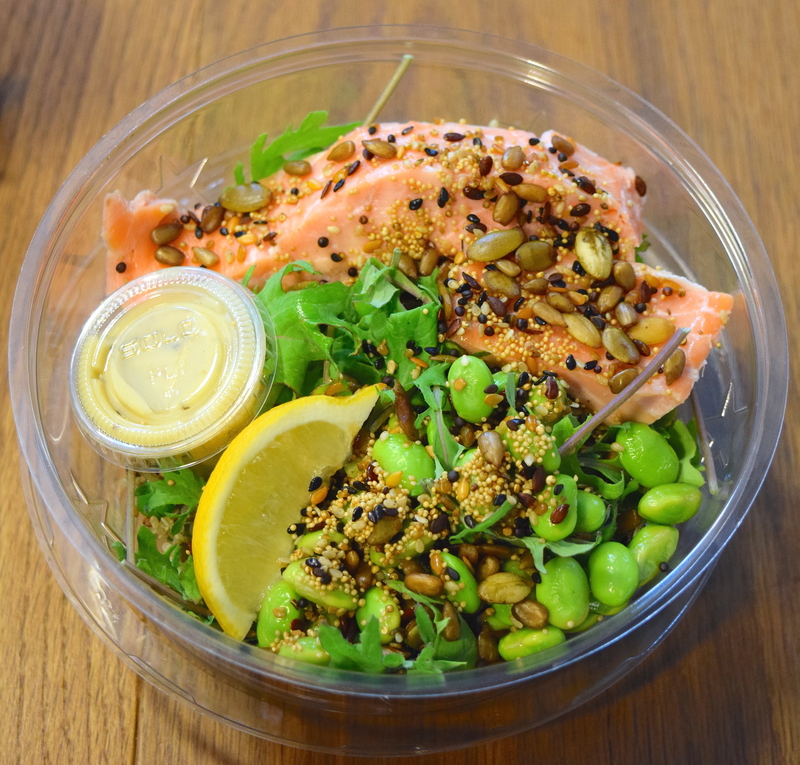 For example, their new Salmon Superbowl contains 75g of salmon… that’s nearly 10g more salmon than other leading high street lunch providers. That totally blew my mind, because I remember looking into the bowl and thinking ‘Wow, that’s quite a lot of salmon’, but it didn’t exactly register in my head that it’s more than what you’d get elsewhere. It was amazing looking at the array of goodies on offer. They are introducing 4 new salads, 2 grain based and 2 noodle based. Salmon, chicken, crayfish & roasted vegetables are one of the main components in each of these bowls. Now onto the taste. I only managed to try the salmon and that was quite yummy! It had the right balance of flavours and wasn’t overpowering. The superbowl also contained quinoa (not something I usually eat in my day-to-day life), peas, edamame (also yum) and baby kale – apparently the new best thing! It came with a honey mustard dressing, which added a nice kick to it. I liked the way the fresh peas popped and the slight bite the edamame added to each mouthful. The shape of the lid also means that you can shake the salad once you’ve added the dressing to give it a good old mix – apparently that’s what people do in the states. I honestly couldn’t finish the salad though, and the fact that I’d eaten so many other things throughout the day, could have contributed to that. But in a way, it was nice to be able to go back to it later. They cost around the £5 mark, some slightly less, some a bit more, but definitely good value for money for lunch in my opinion. I spend a fortune at work on not so amazing food, so this will be a welcome change. I haven’t had the cucumber seltzer before, and I like cucumber water, but this was a bit more intense. You either love it or hate it. 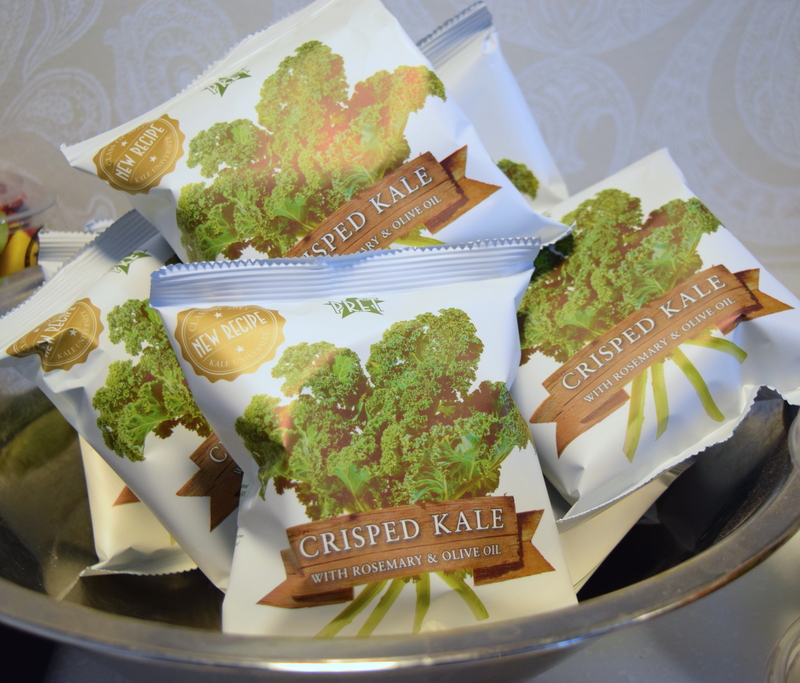 I also tried kale crisps for the first time and fell in love with it. I’ve never really been into kale, especially as a side dish. I tried adding it to some vegetable soup once, and I just couldn’t understand why people liked it so much. 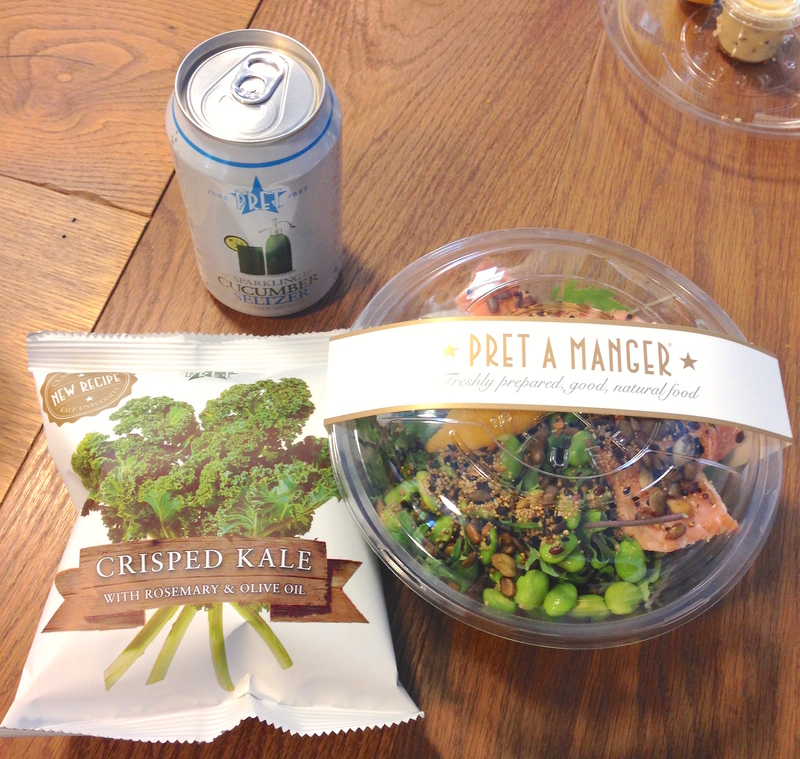 But after trying Pret’s version, I was converted. So flavourful and tasty – I wish they did bigger bags of it! 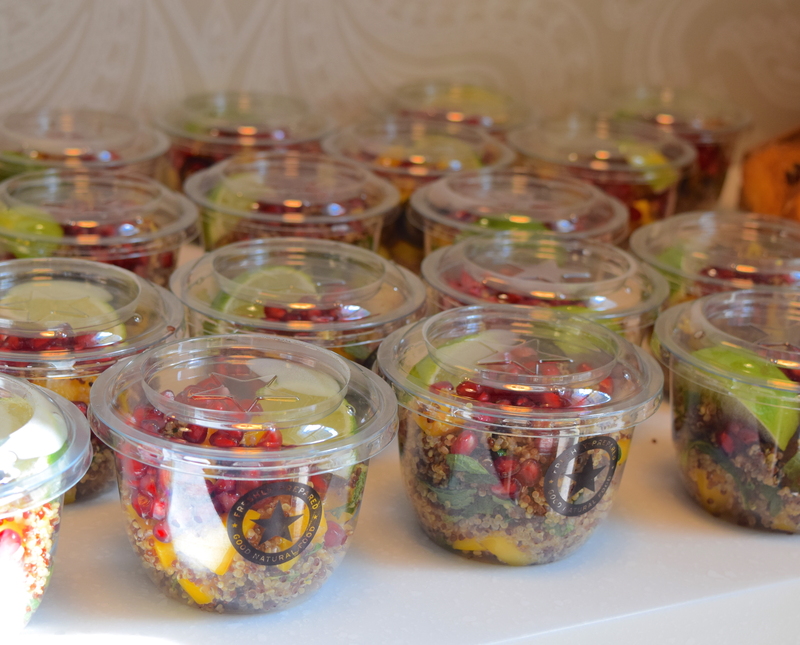 They also had a sweet quinoa pot with fresh mango, pomegranate, shredded mint & a wedge of lime. Again, I can see lots of people loving this. Can’t exactly see myself buying this as a snack, but I know others who would. I would much rather eat these delicious pots of fresh fruit though. I could eat this combination all day long, it is that good! We got to take some treats home with us too, so I’ve been enjoying Pret food all weekend and can truly see myself going there for lunch more often. On a side note, I’m intrigued by their porridge, as it’s meant to be their best seller. Apparently, 20% of their sales is from porridge alone. That is crazy. Porridge, here I come! I enjoyed the session run by the About Time team and picked up some useful tips, especially around pitching ideas, making your blog stand out and increasing followers. I also met some lovely people and it felt like it was over so quickly, even though we had been there for nearly 4 hours. But as they say, time flies when you’re having fun. Oh my how wonderful you managed that 1 free ticket.. The food looked amazing and I’m sure meeting everyone there did as well.. Great post….